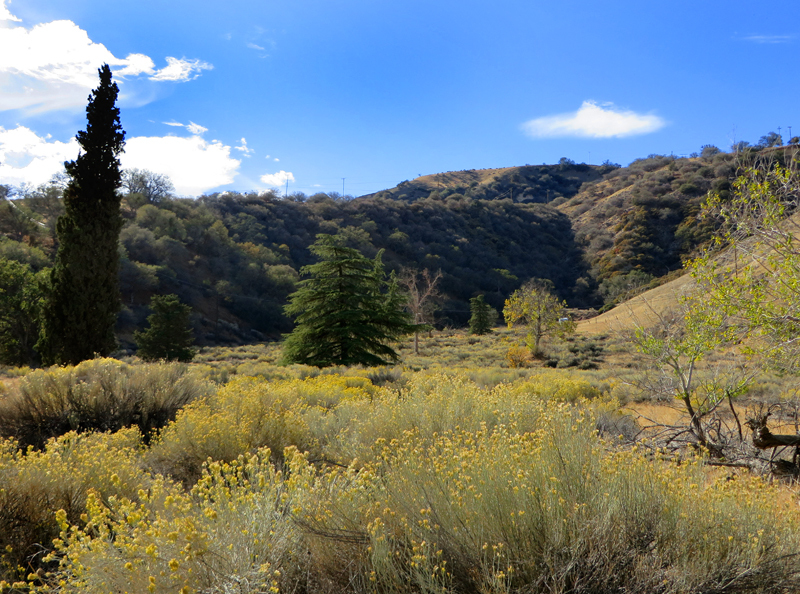 October 22, 2013 — It's just pretty scenery today, but once upon a time, this spot on the west side of Lebec Road was one of the most popular stops along the Ridge Route between Newhall and Bakersfield. The Lebec Hotel was built in 1921 by Thomas O'Brien, a saloon keeper from Bakersfield, and Cliff Durant, an automobile manufacturer and airplane instructor from Oakland. The hotel was built to resemble a French chateau. It was a playland for Hollywood executives and stars in its heyday. Clark Gable and his actress wife Carole Lombard, as well as gangster Benny "Bugsy" Siegel, frequented the Lebec Hotel. Shortly after the hotel opened, Durant apparently tired of his investment and sold his interest to Foster Curry, son of the concessionaire at Yosemite, in 1922. Curry and his wife brought a series of lawsuits against O'Brien to rescind the sale, alleging that O'Brien had improperly instituted a foreclosure on Curry's note. Somehow O'Brien managed to gain control of the hotel as a result of an in-court settlement with Curry. Over the years the hotel fell into disrepair. It was officially closed on November 13, 1968 in response to health department charges concerning its substandard water system and dilapidated condition. The hotel went into receivership and was acquired by the Tejon Ranch Co., which torched the hotel and demolished the remains on April 27, 1971, two weeks after acquiring the property. LW2505: 19200 dpi jpeg from digital image by Leon Worden.